Ever wanted your own corporate TV channel? Maybe you create an information channel that builds credibility for your industry while enhancing your brand? Maybe you create a corporate identity channel for employee recognition and morale? The technology is ready and the time is now. 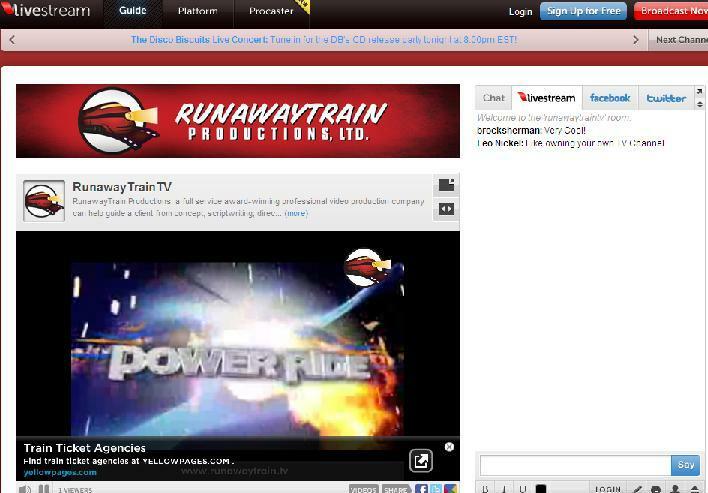 RunawayTrain Productions in a partnership with livestream.com has created RunawayTrainTV for its clients, and we can help you create your own branded network as well. Check it out at http://www.livestream.com/runawaytraintv We realized long ago that traditional television and radio are expensive to maintain, highly regulated, and target too broad a demographic for most corporate, or community uses. As viewers get more sophisticated they seek out entertainment on the internet that is relevant to their interests rather than simply accepting what broadcasters provide. For years, we have been searching for a cost effective way to provide effective, highly stylized content to specific target audiences in a traditional broadcast model. Utilizing the state of the art platform and broadband distribution network at livestream.com, RunawayTrain Productions is now creating unique private and public media networks that incorporate live action, video on demand, animation, and social media connections to Facebook and Twitter. Large corporate entities like IBM , CSPAN, USAToday, and CondeNast, use it, but also smaller, entities like The Women’s Conference, Hear it First Christian Music, and The International Surfing Association support channels as a way to reach their audiences and develop advertising revenue streams. 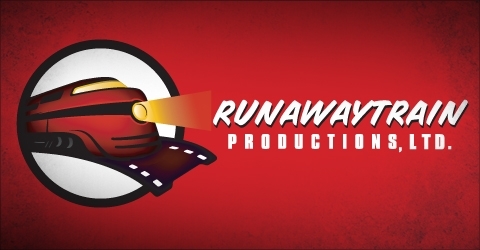 RunawayTrain Productions will work with you to create a professional looking graphics package, develop video on demand content and even stream live events. Everything you need to enhance your brand, engage your target audience and control your message. This Project for the Western Dairy Association takes a whimsical strategy on promoting the dairy industry. The Western Dairy Association wanted to produce a creative and informative marketing piece to raise awareness and enrich the image of dairy farmers in the state of Colorado. The result was a warm and engaging animated video that garnered regional Emmy and National Telly top honors for design. RunawayTrain Productions used a book metaphor to chapter Western Dairy’s key concepts of family ownership, the ethical treatment of animals, and environmental stewardship through sustainability. The design involved creation of a 3D book with turning pages as transitions. The 3D elements were created using 3D Studio Max and added to the final composite using Adobe After Effects. Interviews with dairy farmers were shot using RunawayTrain’s Sony-EX3 camera on the Comcast Media Center’s soundstage in Denver Colorado. The set backgrounds were painted with a chroma key greenscreen allowing for later replacement with animated backgrounds. Carefully designed dolly and zooms were utilized to create segment transitions. In the post production process, award winning creative director Brock Sherman created still image cutouts from captured images and stock footage using Adobe Photoshop. Images were selected to reinforce themes of nutrient rich milk, family pride, care for animals, sustainability, integrity, and Americana. In the final composite all these elements were chroma keyed, motion tracked with camera moves, and treated with various filters to create a warm, engaging presentation that is consistent with the Western Dairy Associations overall marketing values. The Western Dairy Association’s “Cow Caregivers, Earth Caretakers” won both Regional Emmy and National Telly awards for excellence. The video was pressed to DVD for a direct mail campaign, occupies a prominent place in all WDA trade shows, and is featured on the Western Dairy Association website. Western Dairy Association has had an overwhelmingly positive response to the video, and plans are already underway for next year’s project.